The Bali Barat National Park, or West Bali National Park, covers 190 km² of which there are 70 km² of marine protected area including coral reefs and both shallow and deep coastal waters. The park, although a protected area for many years, became an officially declared marine park in 1982. More recently it has been proposed as a World Heritage Site. The park is located on the north western tip of Bali and includes several islands, in particular Menjangan Island - now a world-renowned Bali diving destination. Accessibility and land use within the national park is bound to a zoning system which defines the degree of allowed activities. This is managed by a management body called the Balai Taman Nasional Bali Barat and relies on the co-operation of the 6 local villages in the area as well as help from the Bali Marine Conservation Community (BMCC), a local NGO network that facilitates MPA establishment and management in Bali. The park was recognised as an area of natural importance in 1917 when the Council of Balinese rulers designated the area a 'Nature Park'. It became an Indonesian national park in 1941 in an effort to protect the Bali minah bird, or starling, which is the only bird endemic to the island. There are a range of landscapes within the park comprising mangrove forest, coastal forest, monsoon forest, lowland rain forest, savannah and sea grass vegetation types. The remains of 4 volcanic mountains dominate the landscape, Gunung Patas being the highest at nearly 1,500 metres. The park boasts more than 200 species of plants, 14 of which are endangered species. Over 160 species of birds have been recorded in the park including the rare Bali starling - the key reason why this area became a protected area. By 2001 as few as just 6 individuals were thought to survive. Since then captive breeding and re-introduction efforts have increased numbers but poaching remains a problem. A second captive breeding and re-introduction programme was started in the remote areas of Nusa Penida in 2004. Fauna include the very shy black monkey, macaque monkeys, mouse deer, squirrels, wild boars, leopard cats, iguanas, python and banteng - a species of wild cattle from which the familiar Balinese cows are descended. Java rusa and Indian muntjac, or barking deer, are fairly common. Menjangan Island is named after these animals as 'Menjangan' means deer in Bahasa Indonesia. The last of the Bali tigers, which was a full sub-species of tiger, was shot here in 1937. The marine reserve has a high bio-diversity in a relatively small area. Scuba diving is regulated here, fishing is not allowed and all marine life is protected. The reefs are mostly in good health with an abundance of sea fans and soft and hard corals. In 1998, 110 species of coral belonging to 18 families were recorded, of which 22 species were of the mushroom coral family (there are only 29 species of mushroom coral recorded worldwide). 27 species of Acropora coral were also found, some of which have a diameter of up to 75 cm. The marine park has become an important site for the Climate Change programme of WWF-Indonesia where the impacts of coral bleaching are monitored and used for campaigning purposes to mitigate carbon dioxide emissions in developed countries. The marine programme also provides some support for surveillance against destructive fishing and for establishing strict protection of grouper and other fish spawning sites. All visitors should check in at one of the 2 park offices (PHPA) for information and to purchase permits and arrange guides. The headquarters is at the village of Cekik, just south of Gilimanuk in the west. The other is at Labuan Lalang on the north coast from where the boats to Menjangan Island depart. The official permit charge is IRp 25,000 per person. The cost of a guide is negotiable. Only a small percentage of the total area of the park is open to visitors. These areas can be explored by hiking or by diving/snorkelling. Walking the trails must be done with an official guide from one of the national park offices. Boat trips to Menjangan Island can be arranged in advance by your hotel, or by charter on the day you arrive. Accommodation - there is one official high end resort inside the boundaries of the national park on the Prapat Agung peninsula. There is no other accommodation inside the park and staying the night is prohibited. Camping is not permitted inside the national park, but there is a basic campsite at the park headquarters in Cekik which you can use for a small donation. Facilities include toilets and bathrooms. You need to bring your own tent. For scuba divers, the waters of Menjangan Island are a marine wonderland with an abundance of underwater life. You can see masses of reef fish, parrotfish, clams, nudibranchs, sea fans and various sponges, as well as sea turtles, sharks, rays, eels and large schools of jacks. There are first-class wall dives that begin at the surface and go down to 50m, perfect places for snorkellers as well as all level of divers. The awesome reefs offer drop-offs of 40m to 60m. Large pelagics are occasionally seen in the marine park including whales, whale sharks and manta rays. Drift diving is usual, but there are no dangerous currents. Although the best diving is said to be between April and November, during the south-east monsoon, you can dive here all year-round as it offers some of the most protected diving in Bali. Bali Barat National Park is easy accessible from Gilimanuk, the ferry port where ferries to and from Java come and go. 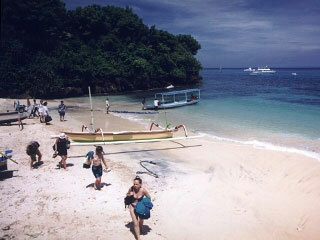 Gilimanuk is reached by ferry from Java or by bus from Denpasar or Singaraja. At Cekik and Labuhan Lalang there are park offices run by the park's governing body, the Ministry of Forestry. Here you can pay the permit fee. To reach Menjangan Island you can hire a motorboat from Labuhan Lalang (30-40 minutes). As a visitor to Bali Barat National Park, your contribution in the form of the permit fee helps fund the continued protection and patrolling of the area so that this beautiful place and the birds, animals and marine life can be preserved and enjoyed for generations to come. Nusa Penida was declared a marine protected area (MPA) by the local district head in August 2010 and in November of the same year the government of Indonesia followed suit, declaring 20,057 hectares of ocean waters around the 3 islands of Nusa Penida, Nusa Lembongan and Nusa Ceningan an MPA. Nusa Penida's waters include several coastal ecosystems such as 14 km² of coral reef, as well as mangroves and seagrass beds. 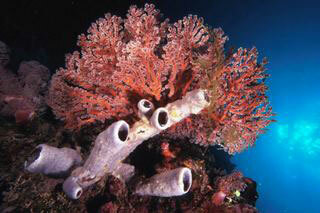 The rich marine biodiversity includes 298 coral species, 576 fish species, 13 mangrove species and 8 seagrass species. Destructive fishing methods, sea weed farming and an increase in both local population, and dive and general tourism, were beginning to upset the delicate balance of these thriving eco-systems. Protective methods put in place now will stand this Balinese island in good stead for regeneration and prevention of further destruction in the future. The Nusa Penida MPA is facilitated by the Coral Triangle Centre (CTC), together with Klungkung District Government and the local community. They protect the site from destructive activities such as cyanide and dynamite fishing while supporting the ability of local fishermen to use sustainable fishing practices. Reef and fish monitoring is conducted and patrols of the waters are ongoing between the police, navy and the community. Core zone: fully protected where all activities are prohibited, except research and education programmes. Sustainable fisheries zone: the fishermen's fishing ground, but destructive methods are prohibited. Marine tourism zone: only tourism activities are allowed in this zone. Seaweed farming zone: only seaweed farming is allowed in this zone. Holy zone: located in front of temple and all boat parking is prohibited. Harbour zone: where the public harbour is located. Special zone: from 9 am to 4 pm only tourism activities are allowed in this zone but from 4 pm to 9 am, fishing activities with small engineless boats and small nets are allowed. From 2013 a permit fee of between US$ 5-15 will be charged as a sustainable financing mechanism to manage the MPA. Around 200,000 tourists visit the Nusa Penida MPA every year. As a dive tourist you not only get to experience amazing scuba diving but your contribution helps fund the patrolling of the zones, enforcement of fishing regulations, and monitoring of the health of the marine life and corals. Nusa Penida has also recently become an unofficial bird sanctuary for endangered Balinese and Indonesian bird species. In 2004 the Friends of the National Park Foundation (FNPF) started a captive breeding and re-introduction programme onto Nusa Penida for the critically endangered Bali starling. In 2006, 64 birds were released into the wild. By the spring of 2009, another 58 chicks had successfully been hatched in the wild and in 2010 there were estimated to be over 100 birds. Similar projects in the Bali Barat National Park have been less successful due to poaching, however the local Nusa Penida community actively protect the birds. In 2006 all villages unanimously passed a local regulation making it an offence to steal or threaten the life of the birds. The awesome Bali diving destination of Nusa Penida offers you exciting drift dives and outstanding marine life encounters with over 20 established sites around the island. The area is home to manta rays, white tip and grey reef sharks, turtles, eagle rays and the iconic mola-mola, or oceanic sunfish. This unusual-looking migratory fish can be seen regularly between July and September but sightings are reported all year round. You will also see healthy hard and soft corals, sea fans, macro critters and big shoals of trevally and sweetlips. The area is a migratory route for whales and dolphins as well as several species of sharks. Resort accommodation is available on nearby Nusa Lembongan for scuba diving at Nusa Penida, and the island can be reached by public boat from the mainland areas of Sanur, Kusamba or Padang Bai in East Bali. Many operators based in Bali offer diving day trips to Nusa Penida also. There are sites for beginners but most are more suitable for experienced divers as currents can be strong and unpredictable. There are also several small community-based MPAs in Bali that have an established outer boundary and are in the process of developing a management body and zoning plan. These are Les MPA and Penuktukan MPA in the north east of the island, and Pemuteran MPA and Bondalem MPA in the north. Reef Check Foundation Indonesia - North and East Bali. East Buleleng Marine Conservation Zone established in 2009. Bahtera Nusantara Foundation - North Bali. 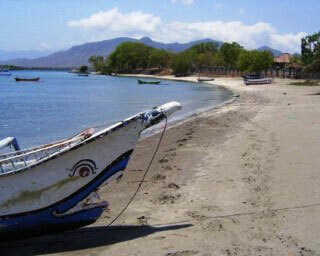 Established September 2000 for coastal resources conservation and sustainable development in the Tejakula district. Nusa Dua Reef Foundation - South Bali. Monitors the coral reefs in Nusa Dua and Tanjung Benoa through a special team in an effort to conserve marine resources in the area. This area is now a proposed MPA but has yet to establish an outer boundary. LINI - North Bali. Established in 2008 to promote sustainable fisheries along with the development of a sustainable and responsible marine aquarium trade through educating fishermen. So the good news for Bali is that while some of its thriving and bio-diverse waters are already under official protection, in time to come more and more of its waters will enjoy the same level of conservation. By going on a Bali scuba diving vacation you can relax knowing that you are directly contributing to the continued protection and sustainable-development of this amazing dive destination.